These distinctive wallets and belts go far beyond utility. They are an elegant fashion statement as well, and make great gifts. Each piece is handmade from carefully-selected and cured skins. 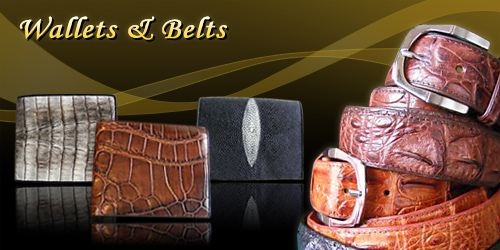 Popular skins for our wallets and belts include stingray, and crocodile. Buying a wallet as a gift? Don't forget to include a crisp bank note! Our stock is refreshed daily, as the latest pieces are made available from our workshop. Click here to see what's available right now in belts and wallets. Don't miss this chance. This website copyright © 2019 The Regnas Collection.